In Images and Symbols: Studies in Religious Symbolism (1991), Mircea Eliade* focuses on the Indian symbols of time and eternity and the function of myth as an account of events that took place in the beginning. In the beginning was a primordial, non-temporal instant, or a moment of sacred or Great Time. Myth takes the person out of their own subjective time, and projects them, symbolically, into a paradoxical instant, which cannot be measured because it does not consist of duration. For example, different notions of time are represented in the myths of the eternal return, infinite Time, cyclic Time, Kali (Goddess; personification of time), and Shakti (spouse of Shiva). Indian symbolism distinguishes two forms of Brahman in the Maitri Upanishad as the “two natures” of a single essence—Time and Timelessness (kālas-cākalas-ca), or Time and Eternity, two aspects of the same principle. I am reminded of how important the existentialist’s concept of transcendence is to this discussion. The image of transcendence from time is found in Eliade’s work as the zenith (summit from which creation began) of the celestial vault at the Center of the World. Here, Eliade points out, the sun (a metaphor for Time) remains motionless for “one who knows,” along with illumination and understanding of the individual’s capacity to escape from Time. This paradoxical instant of enlightenment, often depicted in Vedic and Upanishadic texts, is compared to lightening or spiritual illumination. Here Eliade points out that ancient India recognized two polarities with regard to Time—that of the ignorant who lives exclusively in duration and illusion, and that of the sage or the yogin who strives to “escape from Time.” However, a third, intermediate situation also exists in which the person continues to live in their own time, keeping a way open into Great Time, never losing consciousness of the unreality of historic time, while remaining grounded in psychic exploration. While Eliade understood the eternal present of the mystic as stasis or non-duration, this non-durational eternal present also symbolized immobility (one whose spirit was stable). Through yoga, the suppression of states of consciousness, the psycho-mental flux (stable thoughts no longer flowed), allowed the yogin to live in an eternal present state and yet escape from time. Like a flash of lightning, the illumination of this instant present was able to reveal a paradoxical moment beyond time. Likewise, Buddha reportedly transcended space and time by traversing seven cosmic planes to reach the Center of the World. This “Center” belonged not to profane geometrical space, but to sacred space—a point in which one creates their own Heaven or Hell. Buddha also made use of images analogous to those used by the Vedas and Upanishads; for example, the sun standing still at the zenith was a spatial symbol that expressed a paradoxical moment outside of time. As Eliade points out, this philosophy of time in Buddhism implied the reversibility of time. For the Buddhist, time consists of a continuous flux (samtāna), which because of this fluidity, every “form” that manifests itself is not only transient, but also ontologically unreal. Mahāyāna Buddhism speaks of the instantaneity of time—the fluidity and non-reality of the present instant that continually transforms itself into the past and non-being. Thus, the yogin seeks to destroy the subconscious, having its origin in individual and collective memory, and to abolish the work of time in order to be free. By identifying the opposites in the universal void (sunya), Mahāyāna philosophers (Nāgārjuna), Tantric schools, (Vajrayāna), as well as Hindu, long to transcend the opposites and the polar tensions, to unify the real, and to reintegrate the primordial. 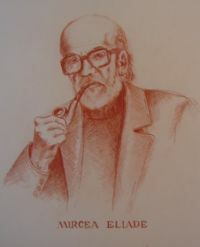 *Mircea Eliade, Ph.D., (1907-1986) studied philosophy at the University of Budapest (1925-1928). His Master’s Thesis examined humanism of the Italian Renaissance philosophers from Marcilio Ficino to Giordano Bruno. The Maharaja of Kassimbazar sponsored Eliade to study Sanskrit and philosophy (1928) under Surendranath Dasgupta (1885-1952), a Cambridge-educated Bengali professor at the University of Calcutta. Eliade returned to Bucharest (1932) to complete his Ph.D., which was published in French as Le Yoga. Immoralité et Liberté (1933) and revised and republished in English as Yoga, Immortality and Freedom (1958). Eliade lectured as Nae Ionescu’s Assistant in Budapest (1933-1939), served with the Romanian Legation in the UK and Portugal, and moved to Paris (1945) where he taught comparative religion at École des Hautes Études at the Sorbonne. As Chair of the History of Religions Department at the University of Chicago (1958-1986), Eliade launched the journals History of Religions and The Journal of Religion, and was the Editor-in-Chief for Macmillan’s Encyclopedia of Religion. Eliade’s noted works, translated from the French, include Cosmos and History: The Myth of the Eternal Return (1954), Yoga, Immortality and Freedom (1958), The Sacred and the Profane: The Nature of Religion (1959), Images and Symbols: Studies in Religious Symbolism (1961), and Shamanism: Archaic Techniques of Ecstasy (1964).